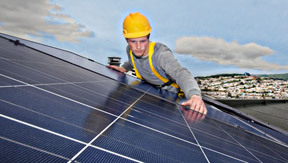 Be a Solar Installer in Less Than a Month! Solar-energy jobs are growing 12 times faster than the U.S. economy. Per the Bureau of Labor Statistics, solar installer employment is projected to grow 105 percent from 2016 to 2026, much faster than the average for all occupations. Starting in 2020, the State of California will require that all new homes built have solar panels installed. This rapid expansion and adoption of solar panel installations in homes, commercial buildings, golf carts, swimming pools, water fountains, attic fans, and more will result in excellent job opportunities for qualified individuals. Our crash course in solar design and installation, followed by free hands-on practice doing live installations, can help make you one of those qualified individuals. The solar industry now employs more people than coal, oil, and gas combined. Completion certificate given the last day of class. $40 material fee due at registration. Great for engineers and engineering students, homeowners, contractors, infotech personnel (think smaller and remote-operated systems), and those who want to install, maintain, inspect, or design solar installations.